Buy your beets with the greens still attached--it's great way to check for freshness and the greens can be used for another recipe. If you want to make this salad quickly, use precooked beets, available in the refrigerated section of the produce section. Place the beets in a shallow covered baking dish. Add enough water to come 1/2 inch up the dish. Cover and roast for an hour or until beets are easily pierced by a paring knife. While the beets are cooking, prepare the vinaigrette. In a medium bowl, whisk together the vinegar and chopped herbs in a mixing bowl. Slowly whisk in the oil. Remove the beets from the oven. When cool enough to handle, rub off the skins or peel with a small paring knife. Chop the cooked beets into 1/2 inch cubes, then toss with the dressing. Divide the greens onto four plates. 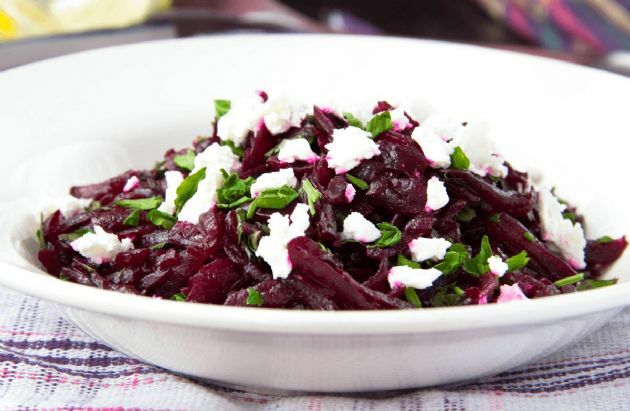 Top each serving with 1 cup marinated beets. Sprinkle on the feta cheese and serve immediately.